Krivsky did see his 1.67 WHIP from last year, right? And the 1.50 WHIP he carries for his career? That means, by definition, that he doesn’t know how to get people out. He does induce the ground ball, though, which can play to his advantage at the homer-friendly Great American Ballpark. I wish Krivsky had said that instead. Pirates add Matos with minor-league contract. The best part about Luis Show ‘Em My Matos is his nickname. This guy has had exactly one season where he was above average, and was downright putrid last season. Waiver wire, here we come. Blue Jays add Ohka to compete for fifth spot in rotation. I was going to make fun of J.P. Ricciardi for this one. It’s fun because he’s supposedly a Moneyball disciple, yet makes batshit insane decisions on a regular basis (Royce Clayton and John McDonald at short? Might as well have the pitcher bat). But Ohka makes plenty of sense, especially on a one-year deal. He’ll find a rockier path now that he’s in the AL East, but he should still be able to post league-average numbers. 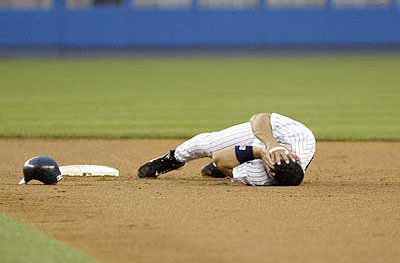 Jorge Posada: Bernie not going to retire. This is a story that I don’t quite understand. Thanks, Jorge, for telling us NOTHING. And I heard the comments via radio on the way to work. Judging by his stutters, he knew he sounded like an idiot.